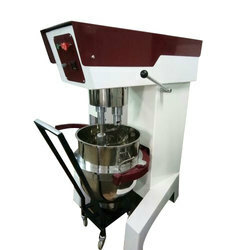 Our INDUSTRIAL PLANETARY MIXER is specially designed to meet the mixing needs of Food & cosmetic industries. The unit comprises of a stainless steel vessel fitted with a fixed slow speed stirrer. The raw material gets prepared inside the vessel. This equipment is used for mixing semi solids.